I hope you will. Aquavit is a bit of an aquired taste, especially the ones heavy on the taste of caraway. But I hope you like it. Your cocktail looks great Andrea. 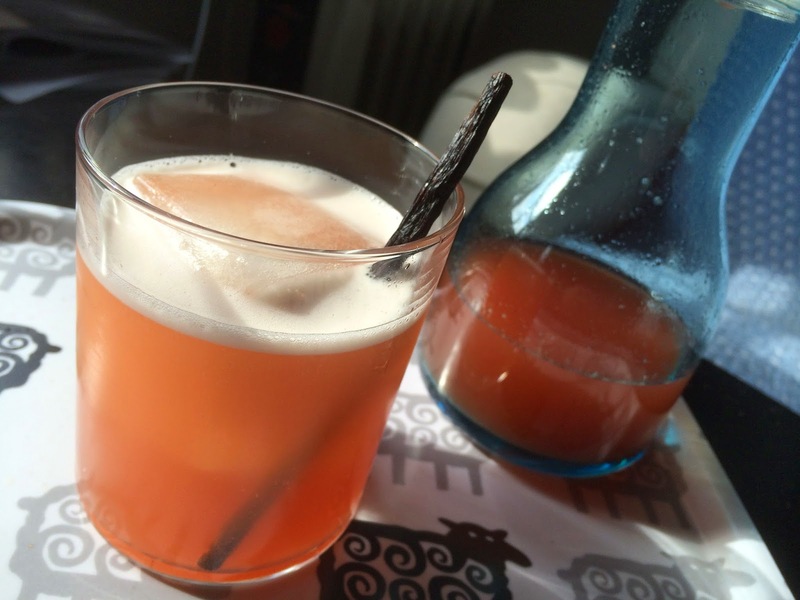 Rhubarb and anise is a great combination. Love the idea of the Vanilla Bean Straw, were you able to use it as a straw? Absolutely - and the straw added vanilla taste to the drink as I used it. (I tried drinking through an ordinary straw for comparison). It's well worth the trouble for a drink lending itself to vanilla notes. It sounds like a really fascinating drink and I am eager to try it. When making the cordial approximately what measurements should I use if I start with three stalks of rhubarb like you ? Sugar, water, black pepper, lemon juice, cardamom ? 3 stalks chopped into bits, two cardamom pods, 5-7 whole black peppercorns, about 50 grams of sugar, juice of half a lemon and about 1 dl of water. Bring to a boil and simmer until the rhubarb is mushy about 5-8 minutes. Strain and cook. I tried this this past Friday, and even though I omitted the vanilla pod straws I must say it was a very good cocktail, which I will probably make again soon. I used Linie Akvavit which had a pretty pronounced caraway taste, but I think it played along well with the other ingredients. It turned out a little frothy just like yours- I guess that's from the cordial. Thank you for sharing your wonderful recipe. I am sure to try more of the ones you have posted. I am so happy you liked the cocktail and might mix it again. Also impressed with you choice of Aquavit. Cheers!